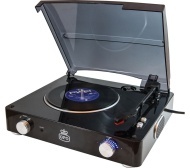 alaTest on kerännyt ja analysoinut 24 arvostelut tuotteelle GPO Stylo Turntable - Black. Keskimääräinen antama arvosana tälle tuotteelle on 3.4/5, verrattuna keskimääräiseen arvosanaan 4.1/5 kategoriassa Audiolaitteet. Me analysoimme käyttäjien ja ammattilaisten antamia arvosteluita, tuotteen ikää ja muita seikkoja. Verraten muihin tuotteisiin kategoriassa Audiolaitteet, GPO Stylo Turntable - Black on saanut alaScore™-arvosanan 89/100 = Erittäin hyvä. Internal Speakers aren't great but easy to use the aux out jack plug to connect to a decent pair of speakers. Very poor sound quality, constant hissing sound even when not playing. I wasnt expecting great sound quality on a record player for the price I paid. The so called own speakers is absolute rubbish, I bought another product to use to amplify onto another outlet but still the quality of sound is rubbish I now regret buying it and should have waited and looked for something better! Easy to use, compact and sits on unit without taking up much room. Nothing really bad, just when switching off still makes slight power on noise, switch off at plug when not in use. Its a little bit tinny sound ,but plenty volume, but its easy too add speakers to this player, all in all worth the money.